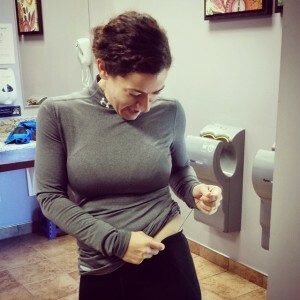 When I first started working out as an adult, I noticed pretty quickly that the process of getting fit involves a whole new set of unintended and very odd side-effects. Over time, the list of side-effects grew and I began to wonder (a) is it worth it? (uh…resounding yes) and (b) am I alone in this misery? (absolutely not) For this reason, I’m going to dedicate one Fit Blog post every month to what I like to call “Problems on the Path to Fitness”. For this month, I’ve chosen to start with one that plagues me every single day: freshly washed workout clothes that still smell like I’ve got a dead rat stashed in them. Perhaps you can relate. Let’s start with some info on the underlying cause- because knowledge is power you know J. The fabrics used for workout wear (like Spandex and Lycra) repel water. Now this quality is awesome and super helpful during your sweat sessions but unfortunately it makes your gear more prone to developing some really funky smells. But wait, it gets better…not only is the fabric working against you, laundry detergent, skin oils and fabric softener are also doing a fantastic job of helping prevent water from getting deep into the fabric. So, who cares, right?? You do, trust me. Because the problem is that if water doesn’t ever completely penetrate the fibers, you’ll never rid your favorite workout shirt of that funky smell no matter how many times you wash it. But have no fear, all is not lost. You can combat that smell of rotting flesh emanating from your favorite workout clothes and I’ll tell you how. Hang wet gear up IMMEDIATELY!! Chucking sweat-soaked clothing into your gym bag (great now your gym bag is funky too), onto the floor (gross), or into a clothes hamper (eeek!) is a terrible idea just in case you were wondering. All of these post-workout habits actually cause the perfect conditions for the rapid growth and multiplication of mildew and mold spores deep in the fabric of your clothes. Those spores get trapped in way down in there and can remain even after a thorough washing. Hang all the wet stuff up as soon as possible to help it dry faster rather than being converted to a mold and mildew breeding ground. I keep a drying rack up in my spare bathroom (when I have no guests staying with me- I’m not one of THOSE people) and when get ready to shower, I just sling them over the rack to hang dry. You could also just chuck them over your shower curtain rod. Pre-treat prior to laundering. Turn all your gear inside out and let it soak for a few minutes in a three-part solution of one ounce of bleach-free laundry detergent, the juice from one lemon to break up skin oils in the fabric, and a half-gallon of warm water. Use your hands to gently scrub the fabric particularly socks and under the arms and at the neckline of shirts. Tumble dry at a low temperature or hang up to dry (inside out in the sun if you can as it naturally discourages the growth of bacteria)- if you zap them with high heat in the dryer thinking you will just cook the bacteria lurking within, you’ll actually cause the bacteria to multiply…ew! So there you have it. By removing any build-up of body oil (with lemon juice) and bacteria (with vinegar), cutting back on detergent, and eliminating fabric softener, more water will actually be able to penetrate the fabric and your clothes will actually start to smell clean again instead of like they’ve been recycled from yesterday’s workout. I know, I know, like you have time for all this, right? Hey, I totally get it. But sadly, unless you want to gain a reputation for being a bit funky (and not in a good way), it’s the price of being a fit person and ultimately these tricks of the trade will save you a ton of money on clothing replacement costs in the long run. Now go forth and launder well, my friends.